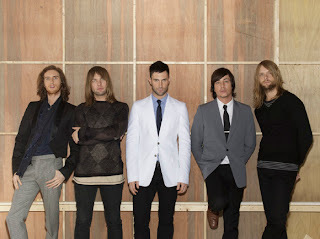 Last night I had the opportunity to go to the sound check and concert for Maroon 5. The guys are really nice, talented guys who actually sang live! It is so refreshing to see that there are still artists out there who can reproduce their album in concert. A few weeks ago I went to see a rock band, whose name shall remain anonymous to protect the guilty, and they lip synced to the point that I left in disgust. Congrats to Adam, Jesse, Mickey, Matt and James for not being like all of the Ashley Simpson's out there. Great show!